So you’ve developed an amazing service, listed it on Manifold and might be thinking, what's next? The Manifold co-marketing program is just one way we support our partners through their launch in our marketplace, through coordinated marketing strategies. Marketing your service on the marketplace is just as crucial as integrating it. You have spent countless hours developing something you're proud of, now it's time to get it to the developers that will appreciate it (almost) as much as you. Through marketing your service you can share the story behind the product, its use cases, and why developers should depend on you. Knowing where your service fits in a project lifecycle, and actively promoting it to developers helps keep it top of mind for when they need your solution, and help your product stand out when it’s time to make a purchase decision. Content – showing developers why they need your product, and helping them to understand how to implement it goes a long way to inspiring developers to choose your service. More content increases your visibility and augments your chance at converting a user. Community – developers operate in fragmented communities which are difficult to reach, we help navigate these intricacies and reach them more effectively through identifying opportunities for integrations, and participating in communities and social media channels native to them. Your listing – establishing a narrative with your product listing to explain to users how your product can solve the pain they are experiencing is really important. Your product listing is the main opportunity to do so in the Manifold marketplace. It is your opportunity to explain the features you have available, and how easy it is to use your product. We have noticed that our most successful providers are active in creating content and reaching their developer audiences. A part of Manifold’s approach to helping users discover your service is integrating inspiring content alongside the purchase decision. This approach to content has been successful and we want to help our providers benefit from it. As part of the co-marketing program, content produced by providers is surfaced in a number of areas which increases your product’s exposure. This, in turn, generates more interest in your service and helps you maintain a presence in relevant communities. Generally, providers that have a large amount of content supporting their listing have a lasting impact on our audience and maintain a strong presence on Manifold. We recognize that nobody knows your service better than you do, that's why our co-marketing program is focused on supporting you and helping to amplify your voice. Stories and patterns are specific formats of content we’ve created to structure particular narratives about services and cloud service architecture. Stories aim to humanize your product and help developers understand your vision and establish a relationship with the people behind the product. Patterns help developers understand how your product fits in the grand scheme of cloud native architectures. 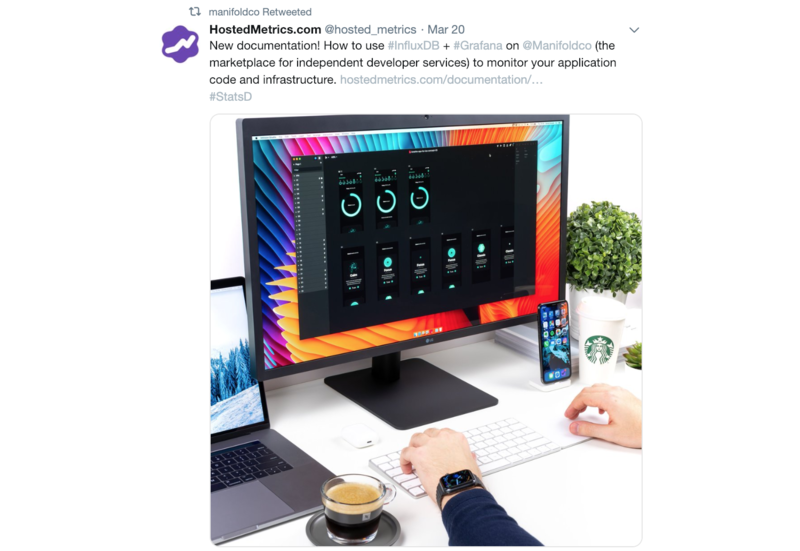 Overall this content is a great way to be memorable to developers, and help them understand what services are available to them through Manifold. Tutorial posts can provide an opportunity to co-create content with complementary services. In our experience content which focuses on the product, and has a specific use-case example, performs best. The goal of these blog posts is to strike a balance between being educational but also inspiring so to generate interest in taking your service for a test-drive. Seeing your service used in different scenarios can help developers to apply your solution to their own projects helping turn page views into service provisions. Developing content with multiple services is another way you can increase your reach by tapping into networks outside of your traditional audience and introduce developers to more use cases for your service. As part of the co-marketing program, we are more than happy to help brainstorm ideas or introduce you to your complementary providers and services. With different types of content, it is our goal to consistently deliver new content and inspire developers to find their next favourite service. We are always excited to work with you to develop ideas and help you create content that allows your service to stand out to developers. We find this type of content to be long-tailed, having lasting benefits and impressions on developers after the initial posting. This helps keep your service memorable for when developers need solutions for their newest projects. Through collaborative social media efforts, we can combine our networks to be more effective at amplifying your message. This is a low-cost way to reinforce or promote any announcements you may have about your service or new feature launches. Additionally, it can help promote other content you’ve created help those build traction in your communities. We aim to be active on social media with our providers and are willing to support your promotional efforts and amplify your messaging in any way we can. Co-marketing doesn't have to create a strain on your team and can be easily integrated into your current marketing activities. If you want to create new content but are unsure where to begin, remember that your inspiration can come from anywhere! For example, you may choose to write a blog post on what you are currently working on, or interested in. Or, if you are launching a new feature, creating a tutorial to go along with it may help promote the launch. It is easier than you think to create content that could have a positive impact on your listing and help educate developers on your service. We are both more successful when working together, which is why we are excited to formalize this opportunity and work with you through our co-marketing program, making 2019 our best year together! If you would like to learn more about how to list your service on the Manifold marketplace, click here to read about our partner program and start your integration.